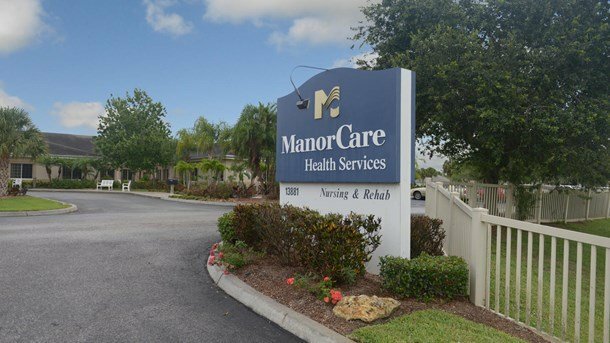 ManorCare Fort Myers is a licensed nursing home that is located at 13881 Eagle Ridge Drive Fort Myers, FL 33912, in Lee County. This facility is a for profit nursing home and provides an individualized post-hospital skilled nursing care in a rehabilitative environment. The owner and licensee of this facility is ManorCare of Ft Myers FL, LLC. There are 120 licensed beds in the facility and the current license that it holds is still effective until December 19, 2019. Based on a review by Medicare.gov, Manorcare Health Services has an overall rating of 5 out of 5 starts or an above average rating. Currently, there is one open lawsuit against Manorcare and some safety citations charged against the facility. Since January 2009, the facility has been sued six times and there is currently one case against the facility that is open. Katherine Elwood filed the suit on behalf of the estate of Alice C. Bryant against Manor Care of Fort Myers. The allegations involve negligence on the part of ManorCare Ft. Myers in terms of the provision of sufficient care to Alice C. Bryant. The alleged negligence of ManorCare Fort Myers which is said to violate, deprive and infringe the rights of Alice C. Bryant caused her physical and emotional injuries. All of these allegedly caused Alice Bryant to suffer from mental and physical pain and was forced to undergo medical testing and treatment. She also suffered disability and aggravation from a previous condition. Ms. Bryant sadly died on April 28, 2017. For the past years, Manor Care Ft. Myers has had a number of citations related to fire safety. The latest of these surveys was on August 17, 2017 and there was one particular citation against Manor Care Fort Myers for this surprise inspection. On August 17, 2017, an unannounced fire life safety recertification survey was conducted at ManorCare and it was found out that ManorCare is not in compliance with Code of Federal Regulations (CFR) 42, Section 483.70, Physical Environment Requirements for Long-Term Care Facilities and the National Fire Protection Association (NFPA) Life Safety Code. Non-compliance involves locking systems of doors in the facility and failure to conduct annual pressure differential for the system duct smoke detectors. Suing Manor Care of Fort Myers? Our lawyers have handled numerous cases against Manor Care for nursing home negligence. Let our years of experience and compassionate approach to the law assist you and your family in your time of need. Our Ft. Myers nursing home neglect lawyers are here to answer your legal questions. Call us now for a free case consultation: 1-844-253-8919.